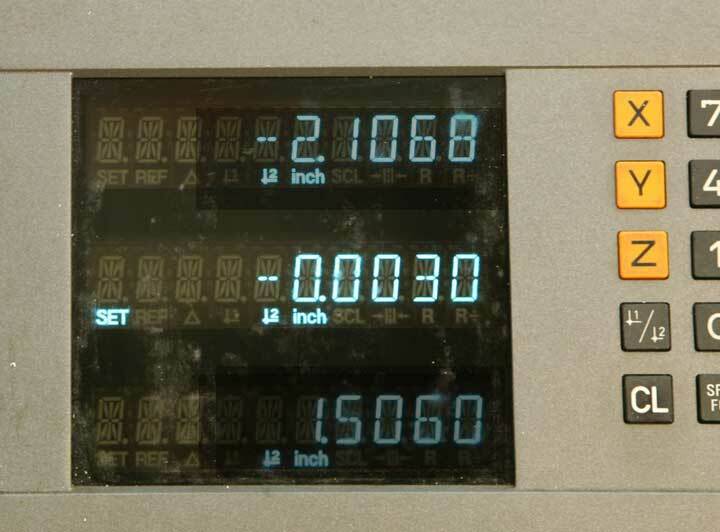 DRO units vary a bit, so to make things a little more clear, I've dimmed the display on the axes that are not in use for each particular measurement. While this milling machine has a Z-axis scale, I've dimmed it a bit more because I'm not using it for this tutorial because the mill you're likely to encounter may have only X and Y scales. 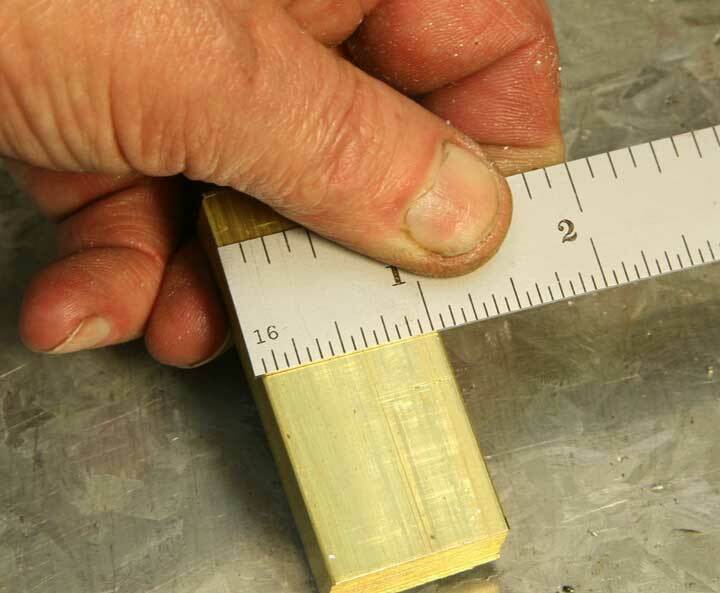 The metal stock for this project includes a piece of aluminum for the base, 5/8" thick and roughly 4" square, a small rectangular piece of brass for the slider, a small piece of aluminum for the handle, and a short section of 3/8" diameter brass rod for the swivel handle. Three screws complete the hardware kit - 2 each, 10-32 button head screws, and one 10-32 socket head cap screw. 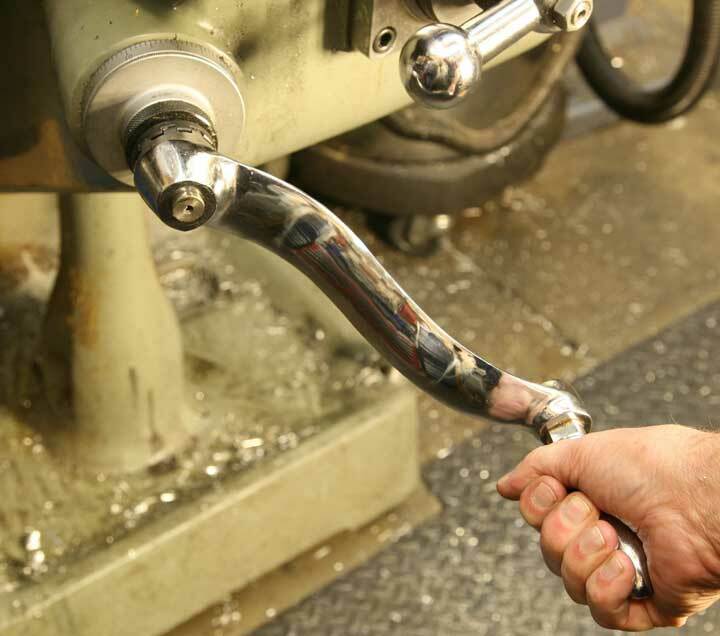 Here are the basic cutting and collet mounted tools you'll be using. 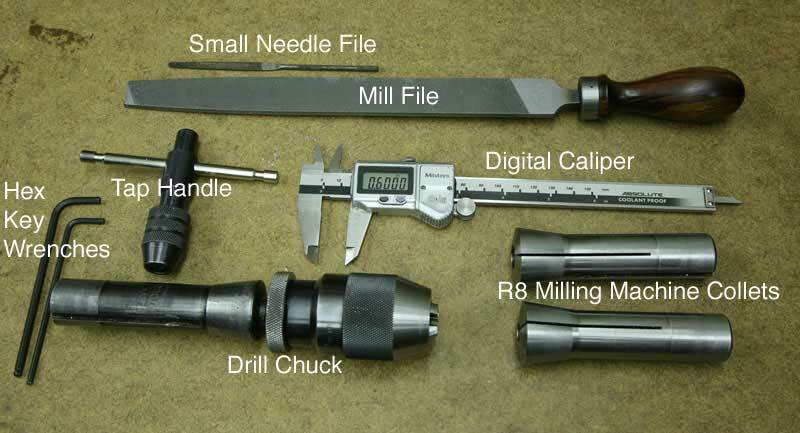 The edge finder, which fits either in a collet or drill chuck, is on the far left. 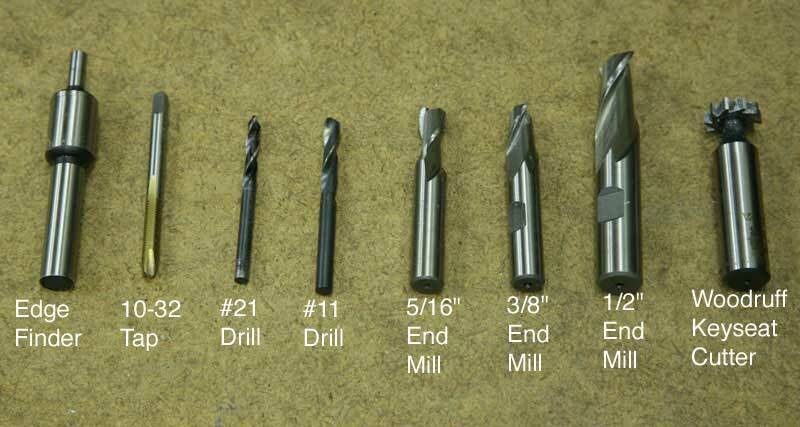 Then proceeding to the right, the 10-32 tap, #21 drill, #11 drill, 5/16" end mill, 3/8" end mill, 1/2" end mill, and the T-slot or Woodruff key seat cutter. 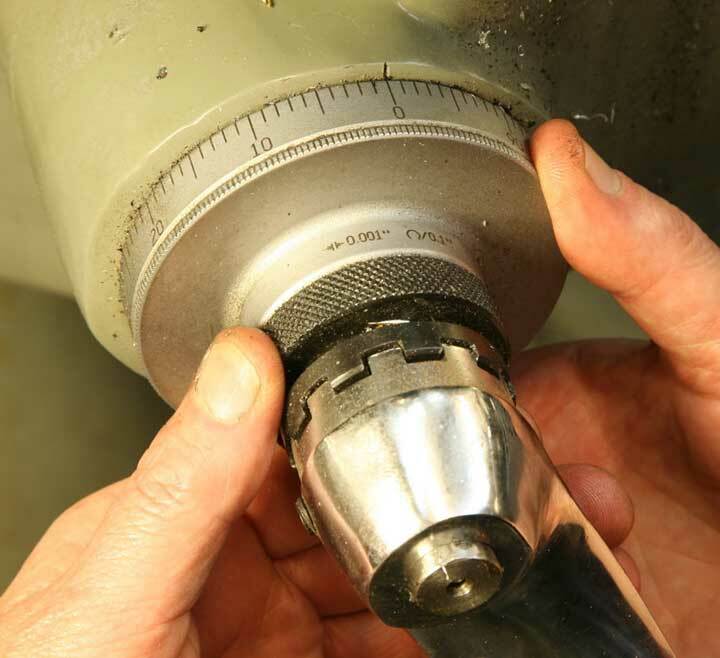 The drills are of the "split point" style, which allows them to start and drill right on center, eliminating the need for spotting drills to guide the drilling. 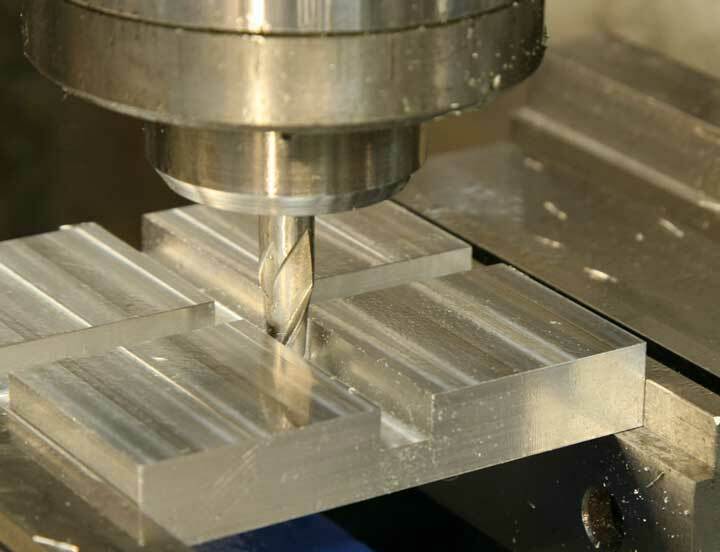 Other tools include a mill file, needle file, tap handle, drill chuck, various milling machine collets, hex wrenches and a digital caliper. 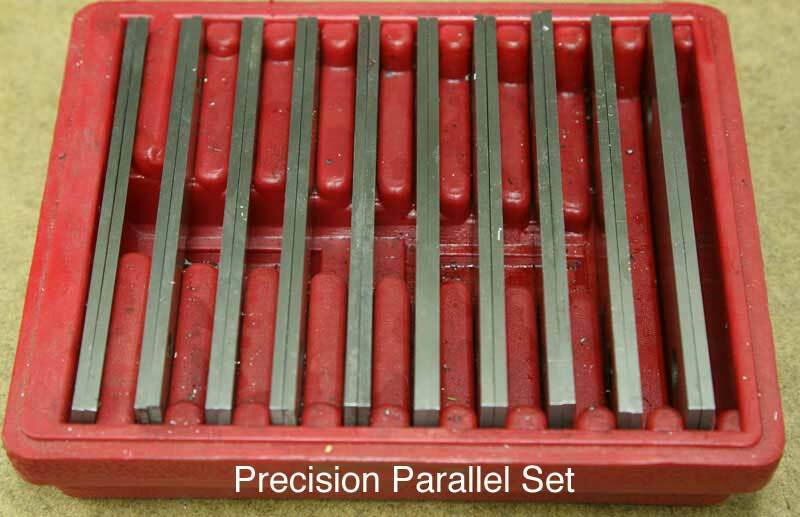 For holding work parallel in the vise, there's a set of precision ground parallels. 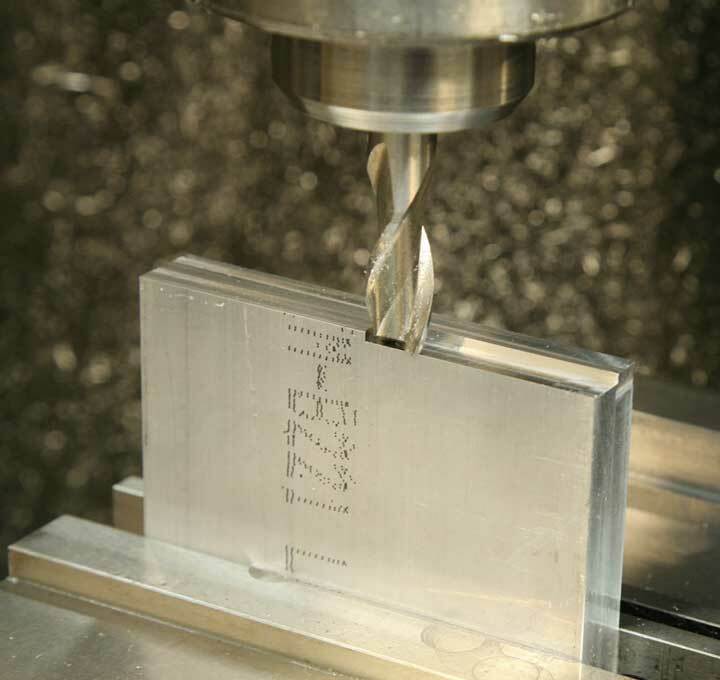 The base is the most complex part of this assembly, and it's the logical first piece to make because other parts have to fit it with a fair degree of precision. This is a 4" x 4" piece of 5/8" thick extruded aluminum. While some surfaces appear flat they are not as flat or square as the might be. Two edges are quite rough because the piece was sawed off a longer section. The first step in truing up the stock is to place one of the straightest edges downward in the mill vise so the top edge can be milled flat. 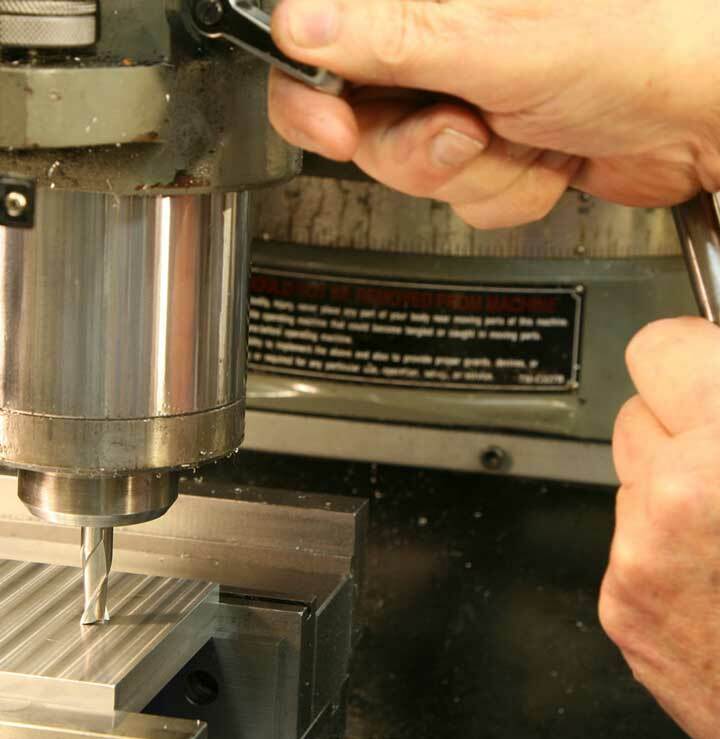 There's a lot of material sticking up from the vise jaws, so you have a serious limitation on the force you can apply without causing excess vibration. 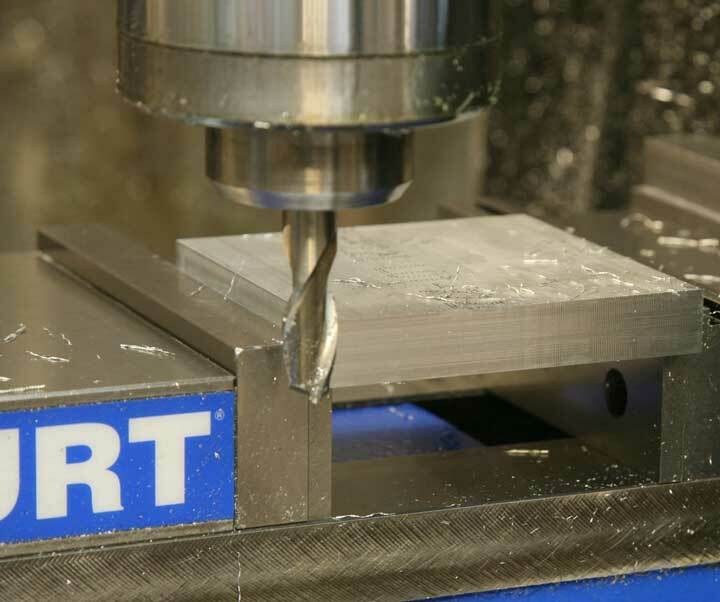 You'll be taking light cuts so this 5/8" thick aluminum can stand up to the cutting action. 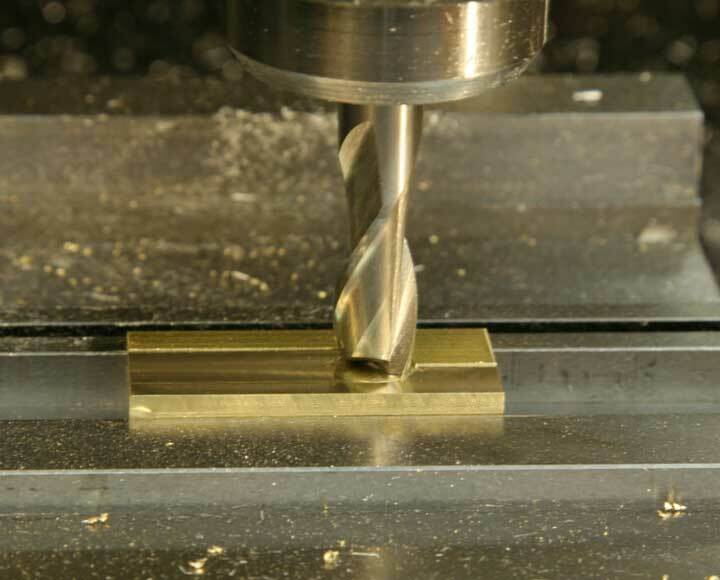 With the 1/2" end mill held in a collet, take a light cuts across the top of the stock in two passes. 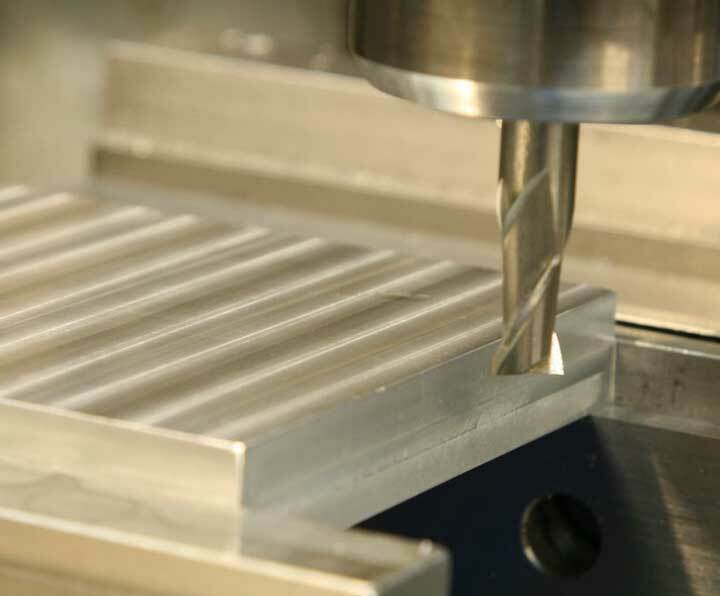 If you run the mill from right to left in the front, and from left to right at the back edge, you'll be "climb cutting," which will create less of a ragged bur on the corners of the work piece. 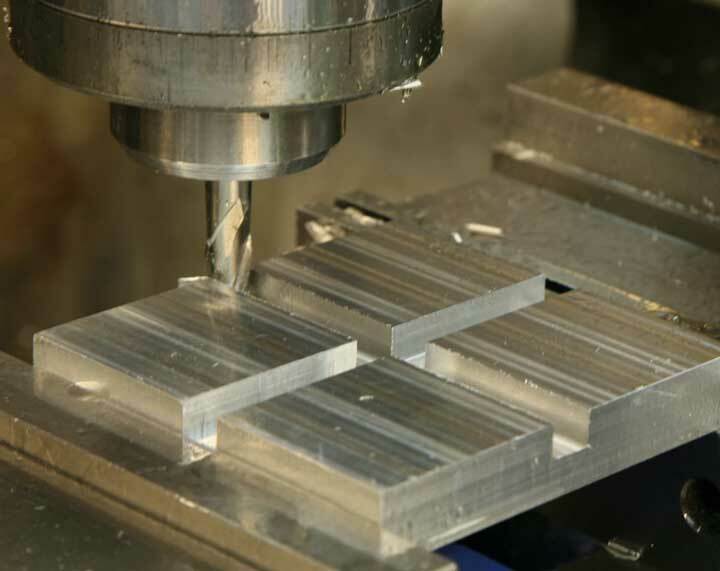 Remember, your goal is to produce a smooth, flat surface without taking off any more stock than necessary. 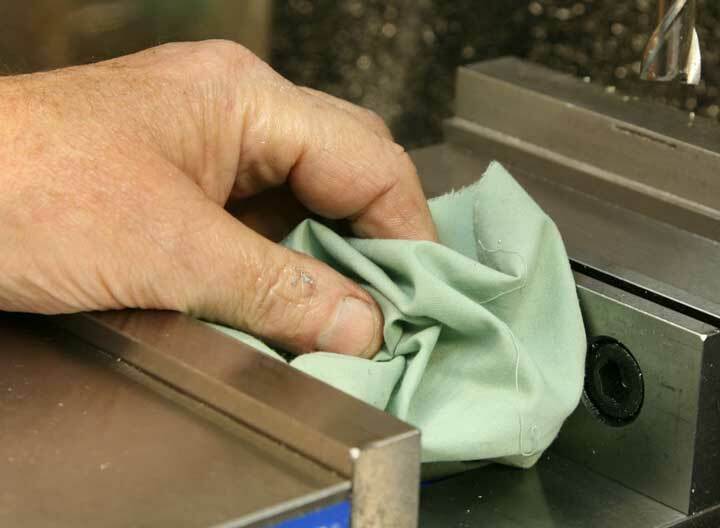 After each milling operation, be sure to clean up any rough edges or corners by filing lightly. 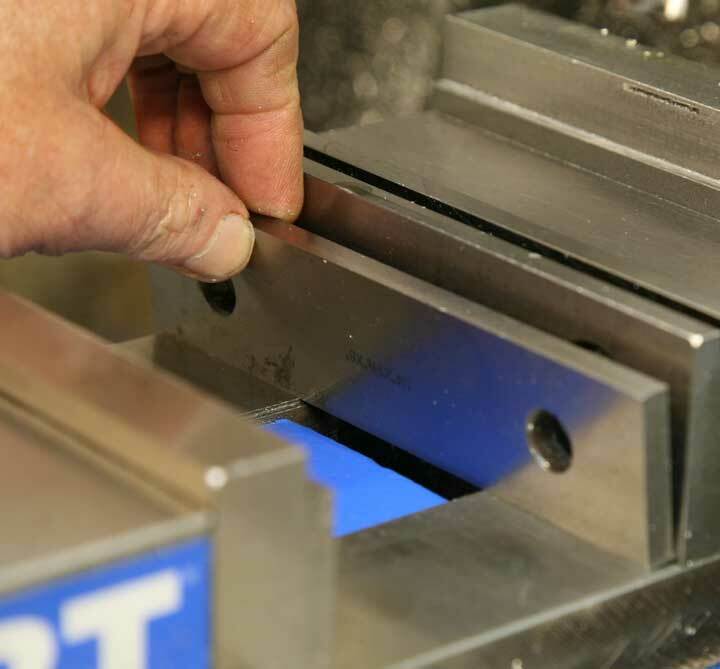 Not only will that make the piece safer to handle with your fingers, it will assure that the metal can be clamped in the vise without having the rough edge interfere with alignment. 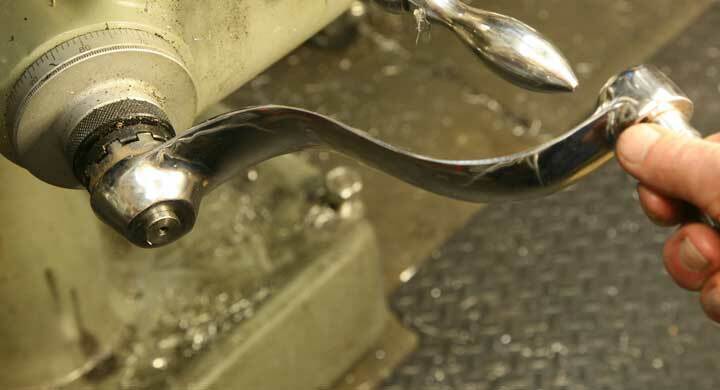 Even though the vise is obviously very strong, it is still important to keep any little pieces of aluminum from being trapped when the work piece is clamped. Clean the file frequently. The easiest and best file cleaner is a simple piece of hardwood you can simply push along the teeth of the file to clean them. A clogged file will not only scratch your work, it will simply not cut well at all. Now, clamp the aluminum block in the vise making sure to seat the freshly cut edge down against the bottom of the vise to get a good alignment. Make a similar cut across the top edge to clean and straighten it just as before. Here's a reminder. 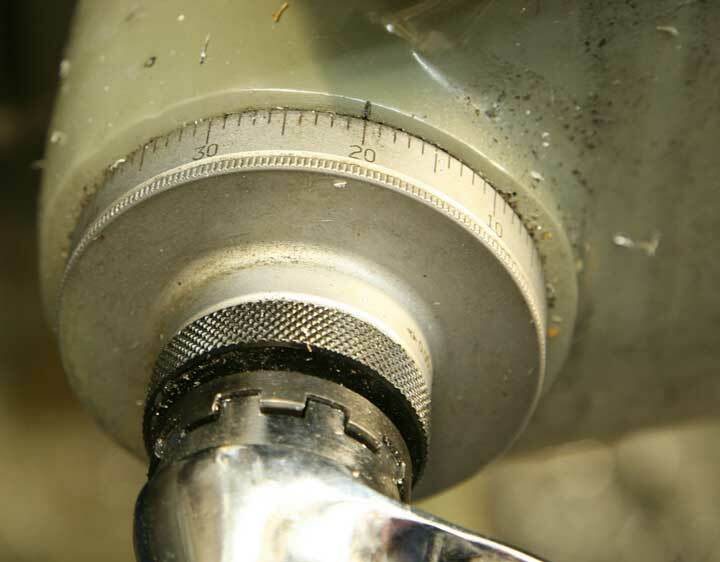 Always brush chips away from the vise, and use a rag to clean the clamping area completely. The same goes for the work piece. You can't get it square and true without working cleanly. 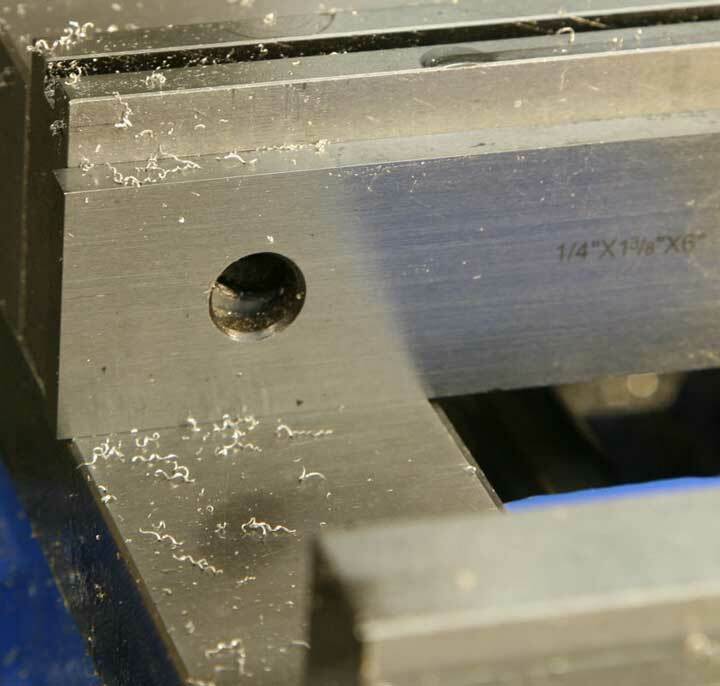 Wipe off and place a pair of parallels in the vise jaws to support the work piece. 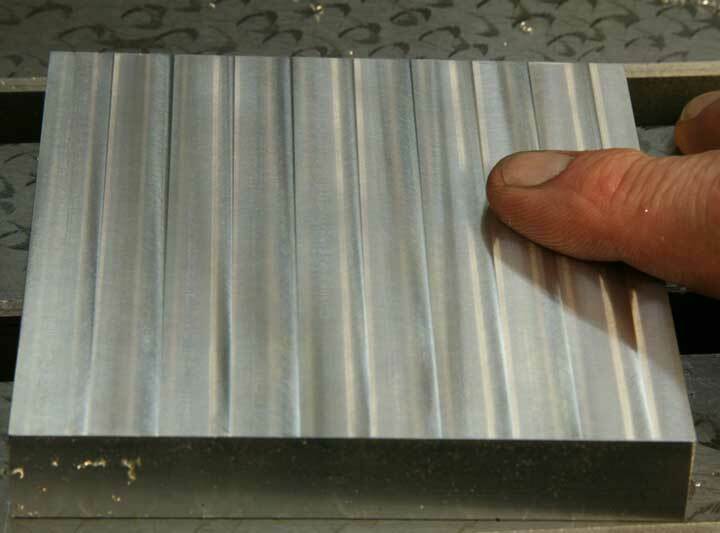 Select a pair that will allow plenty of gripping area for the aluminum - at least half of its thickness. 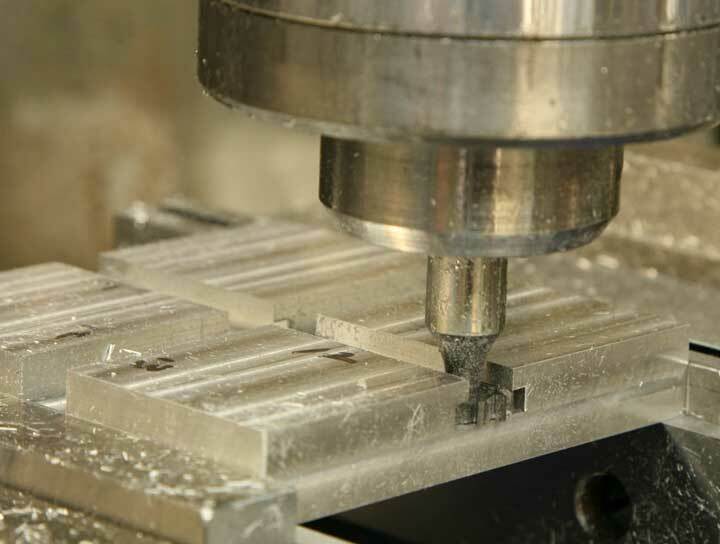 One really good reason for squaring stock is so that it can be held rigidly in the milling vise. 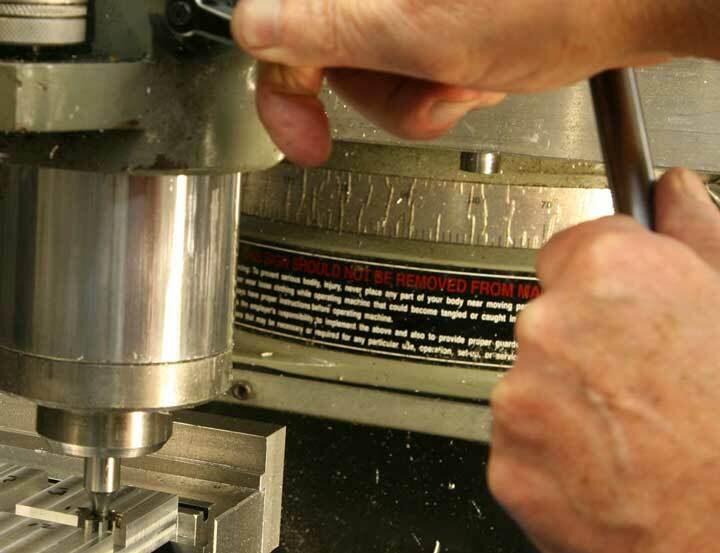 Clamp the work piece in the vise using the newly milled surfaces to contact each vise jaw, and have about 1/2" of the stock hanging outboard so the edge can be milled with the side of the 1/2" end mill. 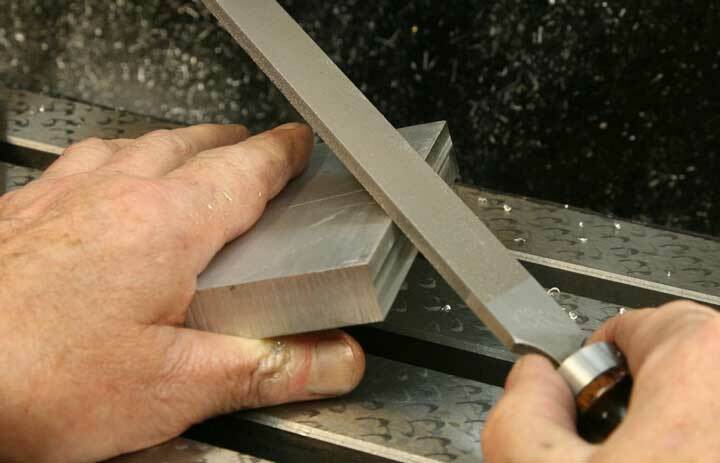 Take a light cut or two, just until you have a nice flat cut across the end. Once again, climb cutting will provide a smoother surface. After you make that cut, turn the piece around and cut the other edge. Now you have a nice block with edges that are parallel and at right angles to each other. It's time to square up the piece so all sides are the same length. Measure the shortest dimension across the block. It should be just a bit less than the original 4" dimension. 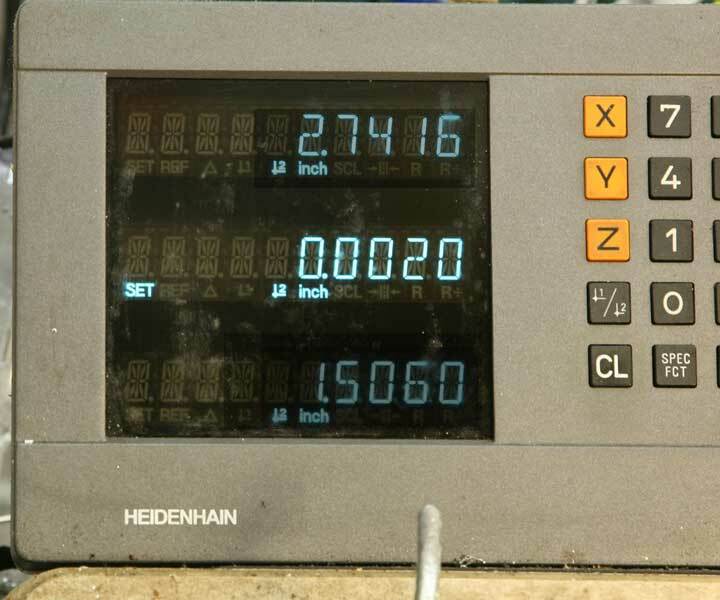 You'll want to have a finished piece that's 3.875" by 3.875" and you can achieve that with a simple bit of calculation and use of the Z-axis dial. 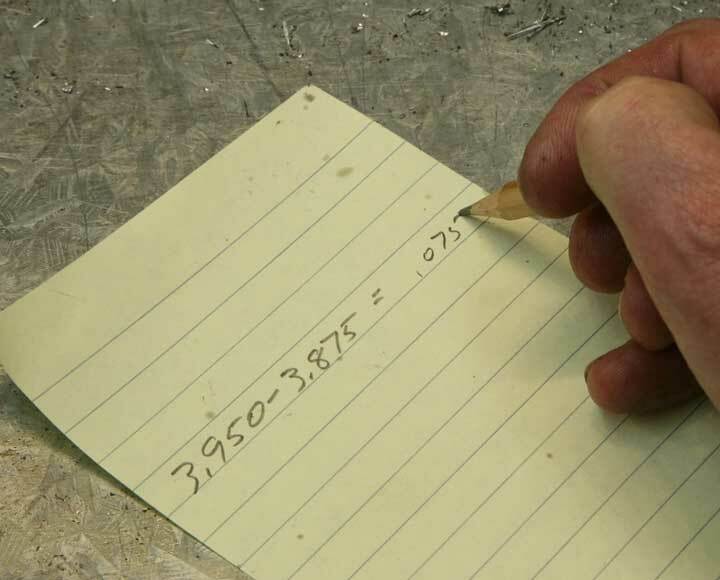 First, subtract 3.875 from the current dimension to derive the amount you'll need to cut off. 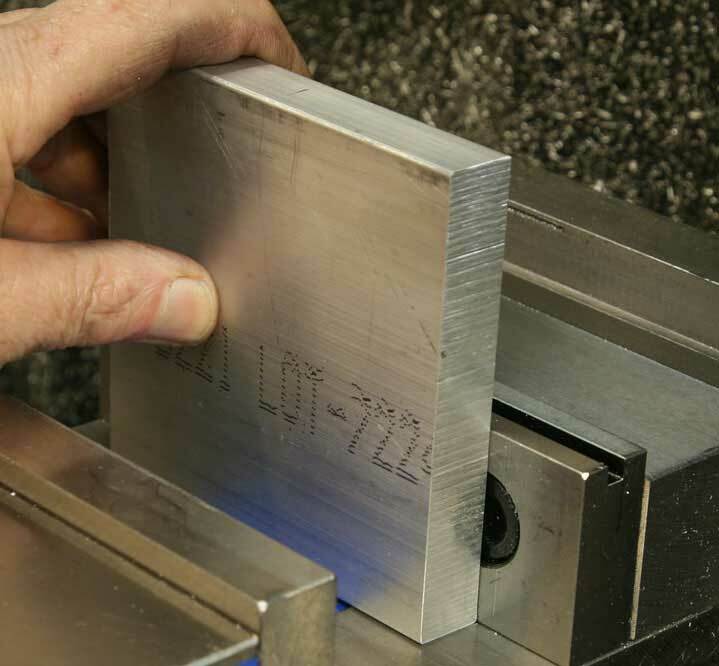 Clamp the aluminum in the mill vise so that the dimension you just measured is oriented vertically. 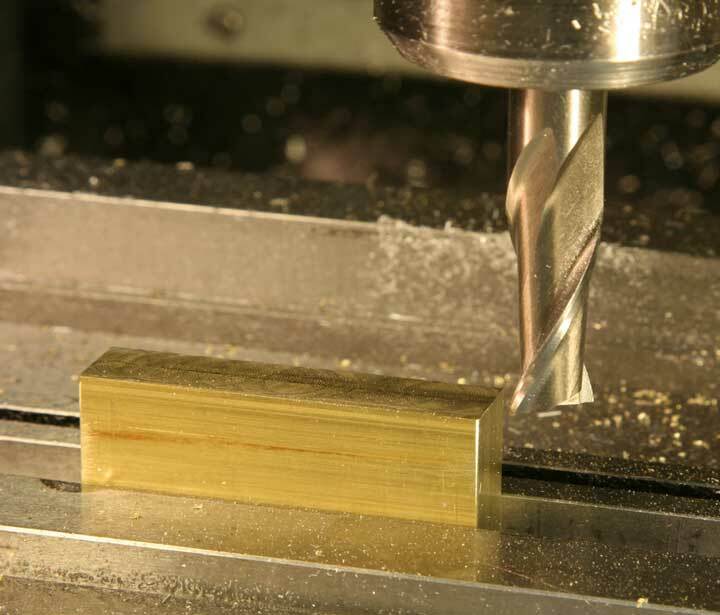 Use the quill to lower the 1/2" end mill until it just touches the top edge of the piece. 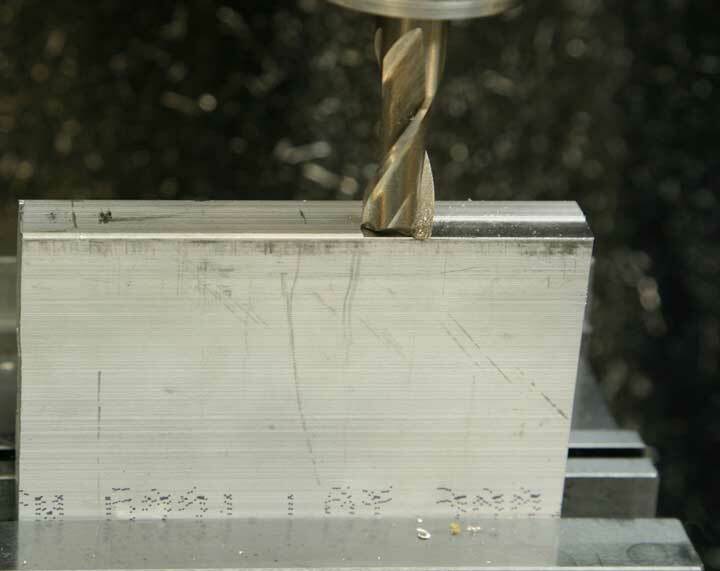 Lock the quill, and crank the X-axis handle until the end mill is no longer directly above the piece. 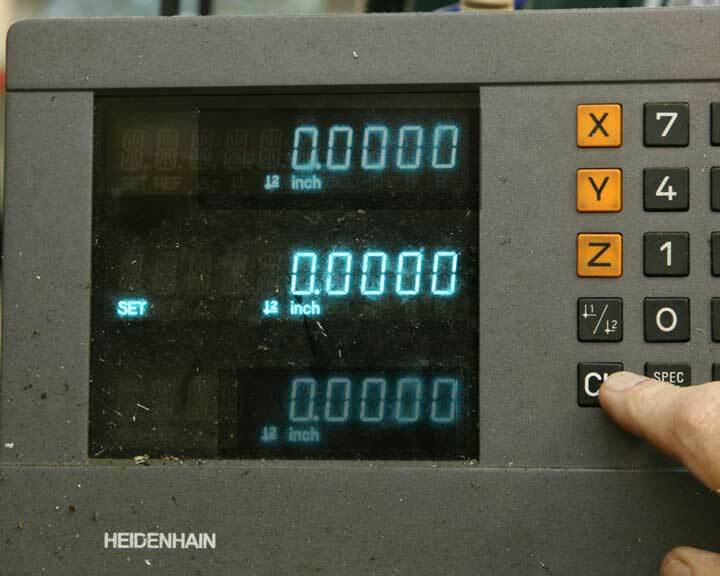 This is the dial on the "knee" or "Z-axis" of the milling machine. 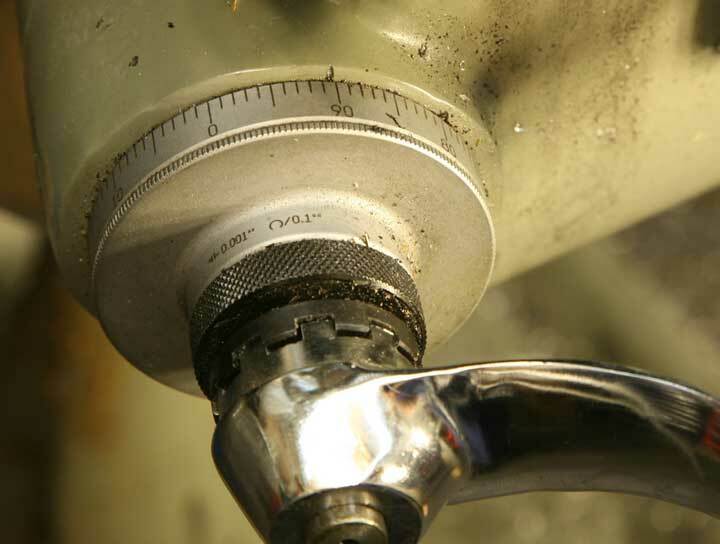 Loosen the locking collar, rotate the dial until it reads "zero" and lock the collar. Now, raise the knee axis by the amount you calculated. 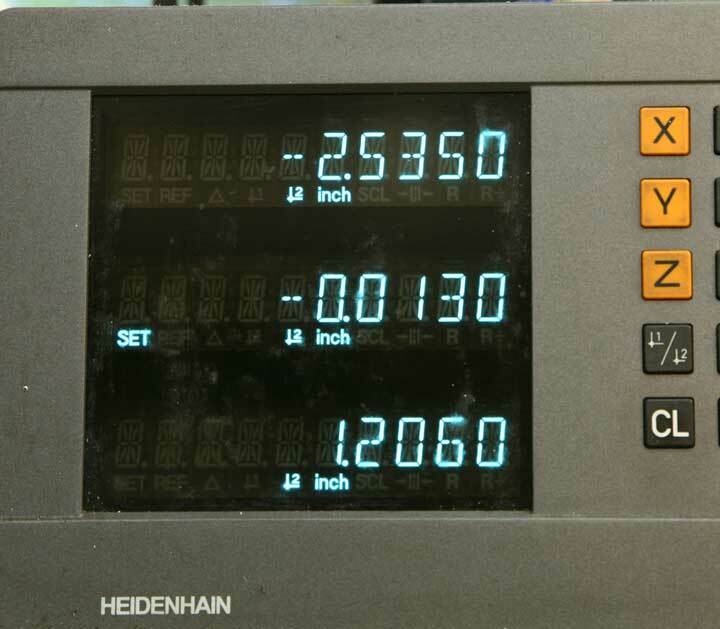 As you can see, my calculation was .075, and my Z-axis reading is the same. 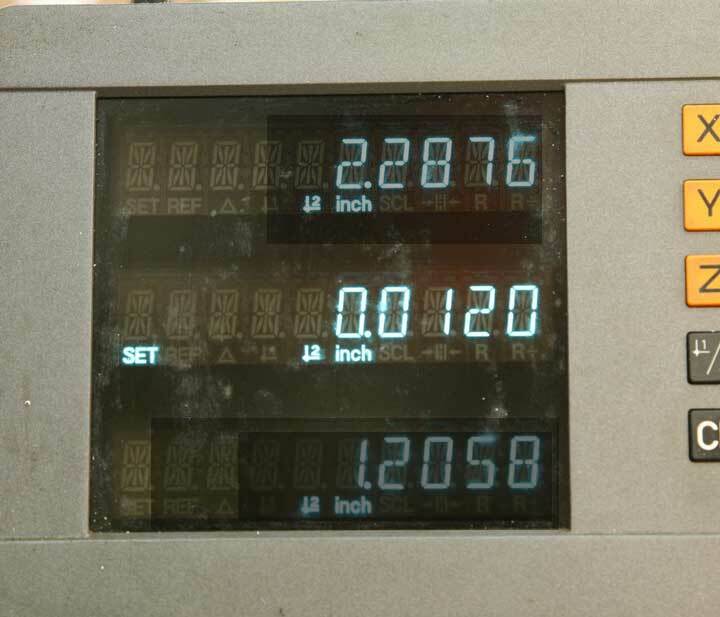 This particular milling machine has a digital readout on the Z-axis, but that's rather uncommon. Most mills that are fitted with DRO units only on the X-axis and Y-axis. 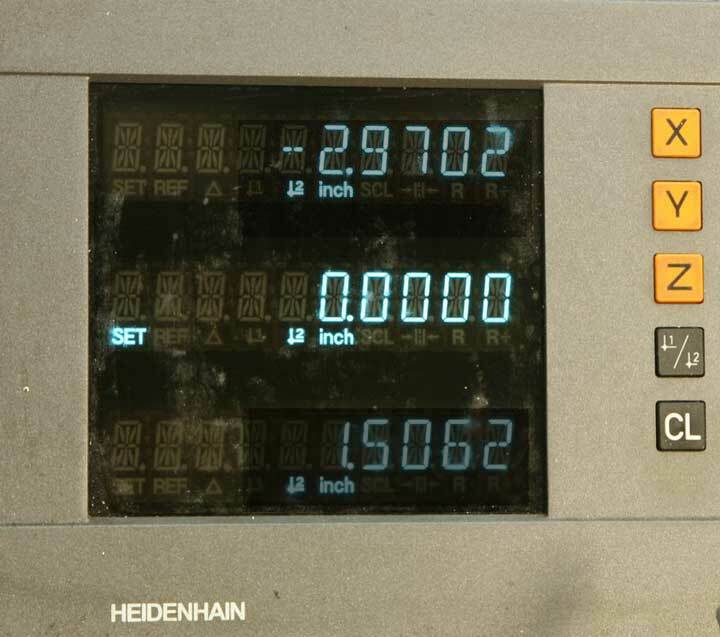 So, while you'll be using the DRO for other measurements, it's best to count on the graduated dial for this Z-axis movement. With the table raised the appropriate amount, take a cut across the top of the piece just as before, in two passes, climb cutting to the left on the front and to the right on the back. File any rough edges, and clamp the piece, rotating it ninety degrees to cut the other dimension with the same table height. 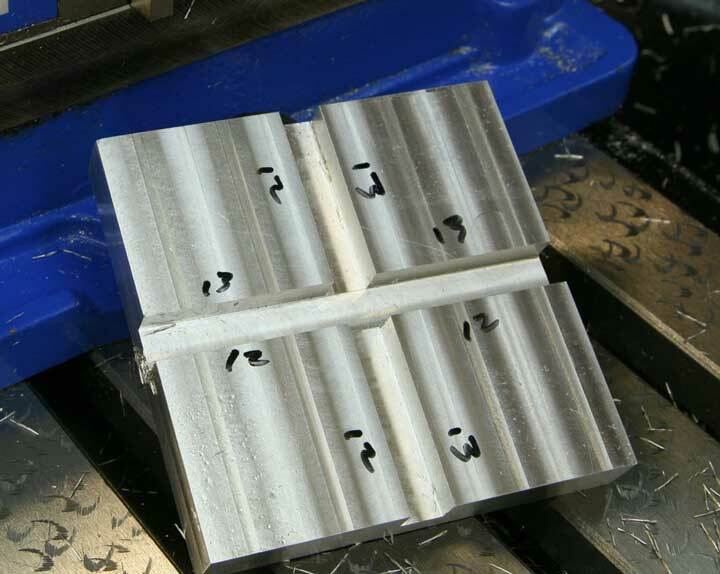 If you were careful in measurement, clamping and adjustments, you should have a nice square work piece, 3.875 x 3.875. Clamp the work piece back in the vise supported by parallels, and take a light cut across the top. If you go very lightly, you'll see how uneven the original surface was. Notice that the piece is actually a bit thinner in the center than at the edges. Raise the knee a tiny bit, and continue cutting until the surface is nicely flat and smooth. Flip the piece over, and repeat the process on the other side. You now have a nice square piece that's flat on all edges. 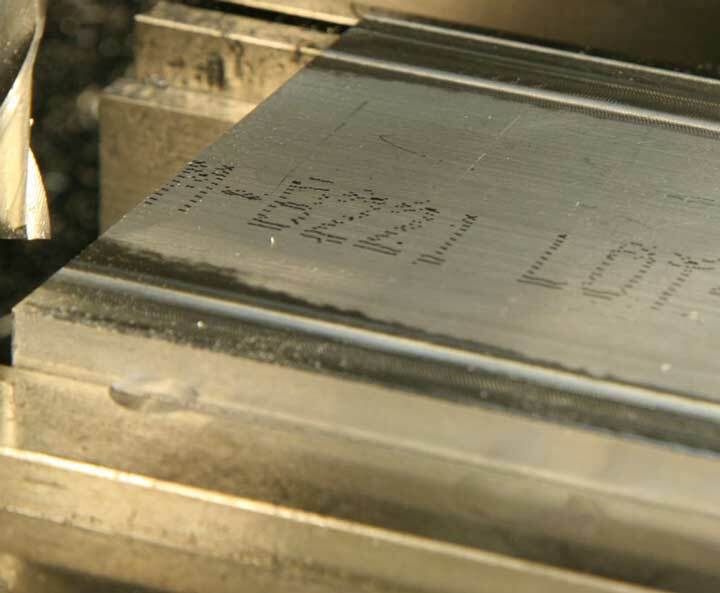 There's no critical dimension for thickness, so once it's smooth and flat, it's ready to go. Once again, another reminder. Keep the clamping area clean of chips. 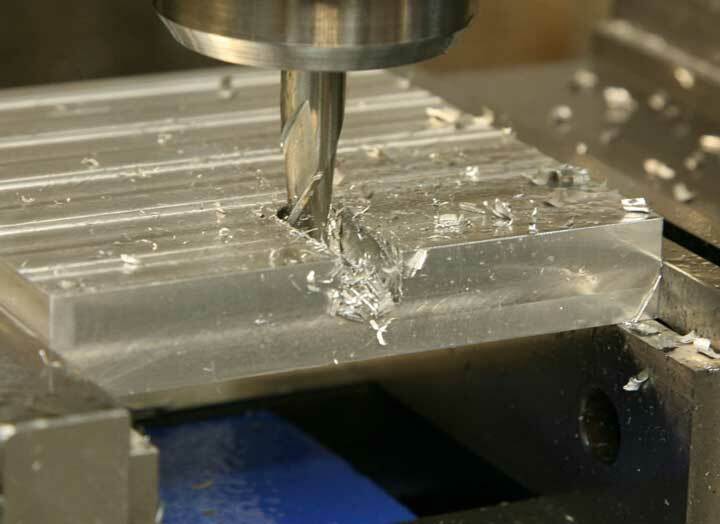 Little flakes of aluminum like these may seem innocuous, but they will get squished against the vise jaws and mar the nice surface you just milled. Keep it clean. OK, now it's time to get serious about measuring. 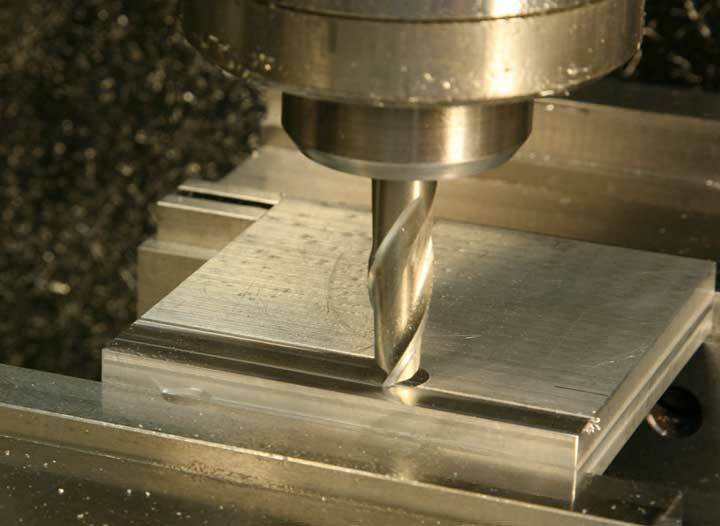 While the DRO can help you position the milling cutter precisely, you have to start from a known reference - the edge. This edge finder is just about the most important accessory for DRO use. Lower the quill so the end of the finder is just below the surface of the work, run the spindle at 500-800 rpm, and slowly move the table Y-axis until the edge finder just touches the work. 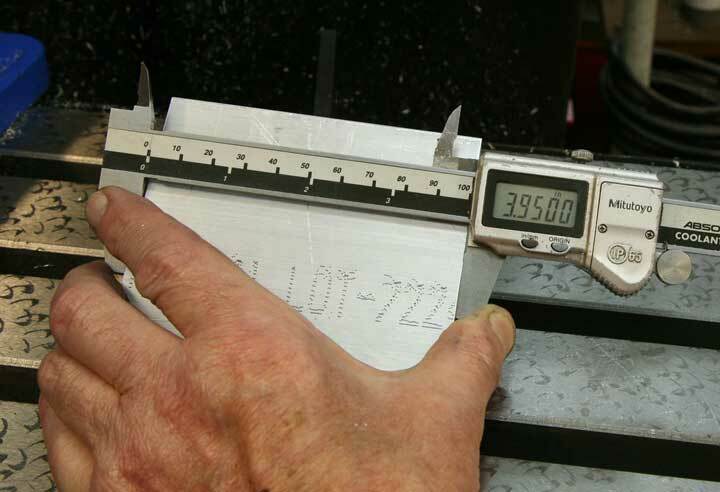 It takes a bit of practice, but once you get the hang of using the edge finder you'll be able to position work with precision. 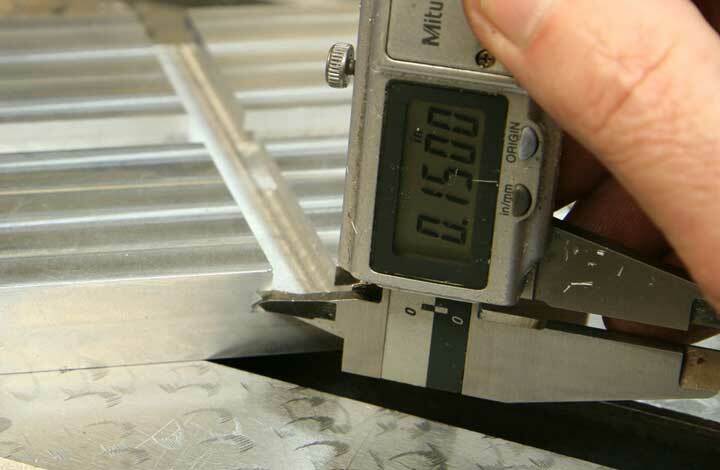 As soon as the edge finder touches the work, the bottom section will "kick out" just as in the photo. Approach the edge several times, and make sure you stop the table movement at the right spot, just as the finder kicks. 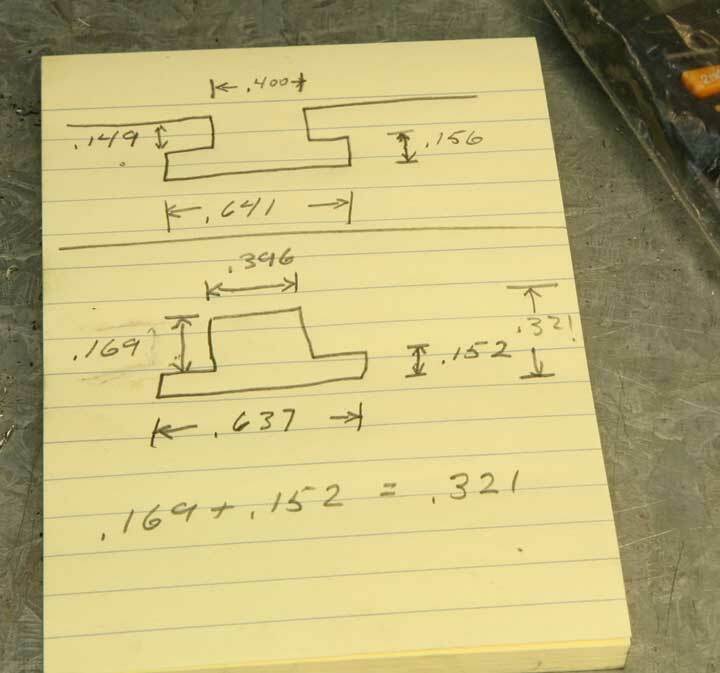 Leave the table in that position, and set the Y-axis of the DRO to zero. Now for a bit more calculating. 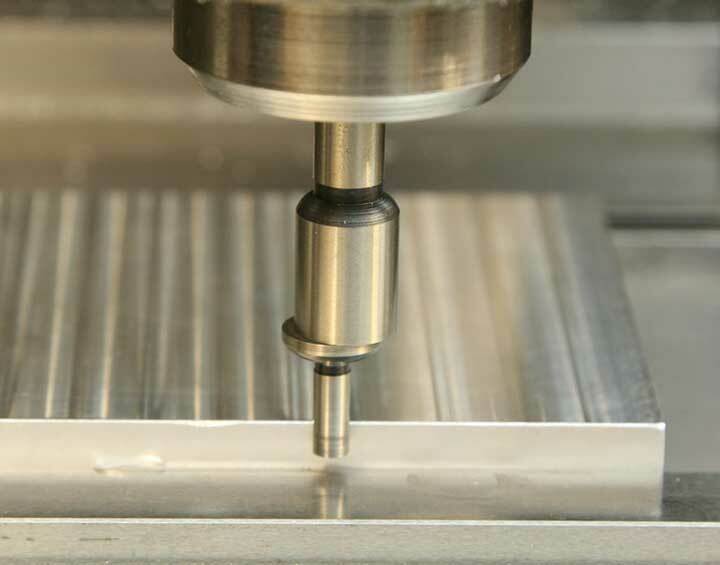 The edge finder has a diameter of .200", so when it touches the work, the axis of the spindle is centered exactly .100" outboard of the work. In order to center the work, you need to add that amount to the distance from the edge to the center. 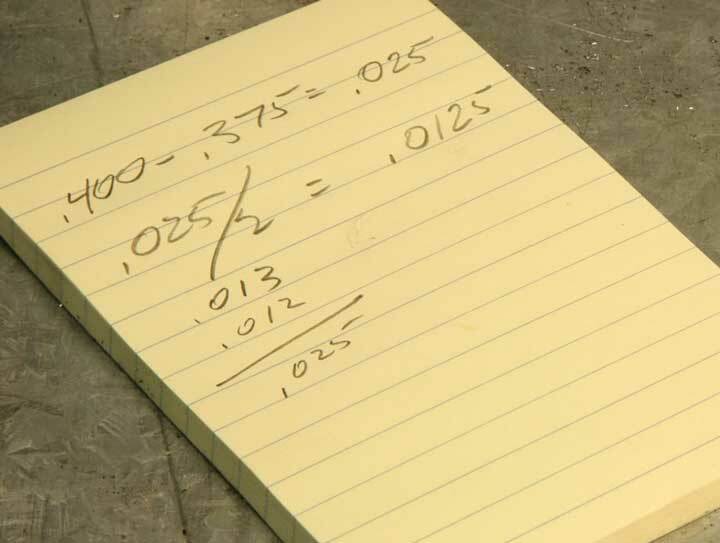 In this calculation the distance doesn't work out to an even thousandth of an inch, so I rounded it off. 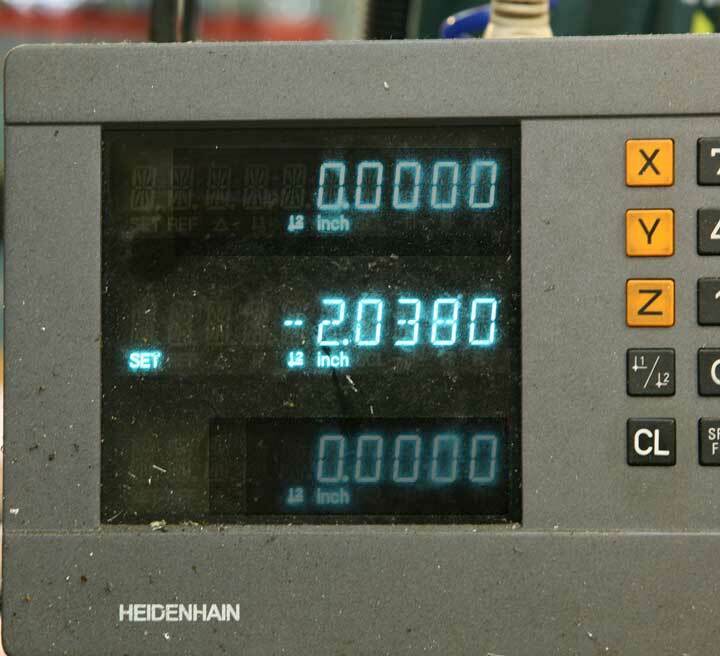 DRO units often read out to fractions of a thousandth, but for most units, that decimal place isn't exactly reliable. Raise the quill, and move the table Y-axis until it is centered according to your calculation. Then, set that reading to zero. Any time you want to return to center, you can move the Y-axis to the zero mark. Because you'll be making a heavy cut along the X-axis, it's a good idea to lock the Y-axis so there won't be any unnecessary vibration. 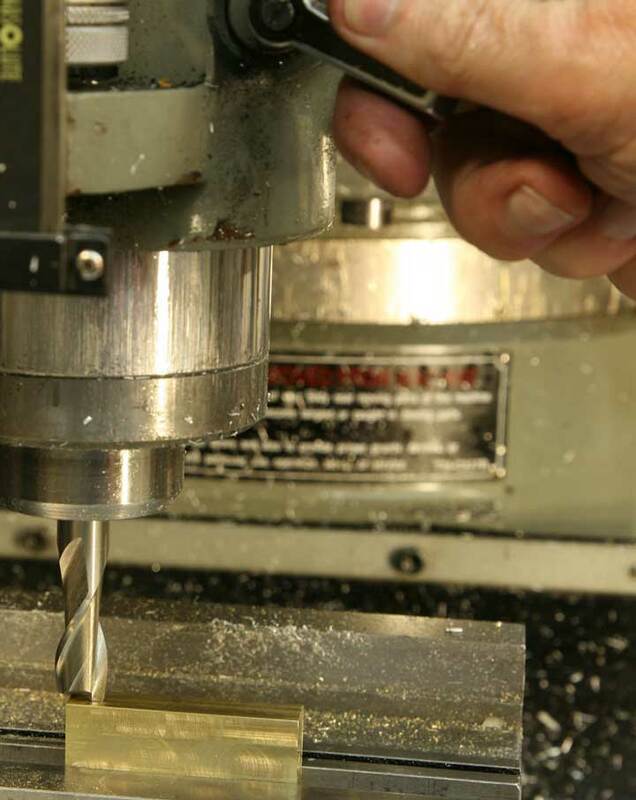 Mount the 3/8" end mill and bring the quill down to just touch the surface of the work piece. Lock the quill. Set the knee dial to zero. Lower the knee a little. 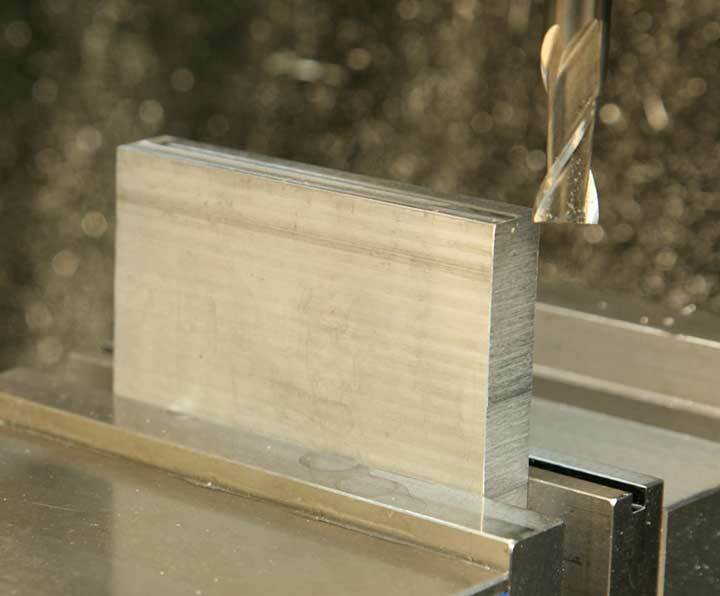 Move the X-axis to the right so the end mill clears the piece. Raise the table to the zero point. Then, raise the table .300," which is the depth of the groove you'll cut. Taking it slow, and using some spray lubricant, cut through the piece from one end to the other. You should have a nice clean groove through the part when you're done. 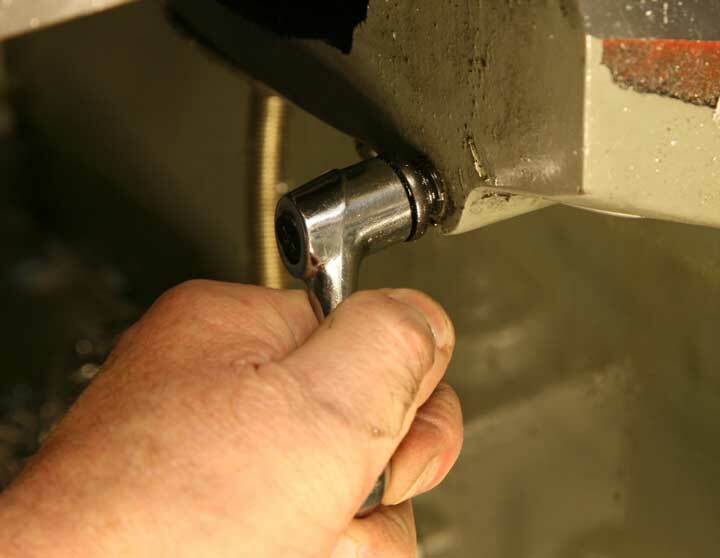 Take the piece out of the vise, clean up and reclamp it after rotating it ninety degrees. Make a second groove through the piece. Now you have a pair of grooves .300" deep and .375" wide. Because you took the time to make the piece accurately square, each groove is centered nicely. 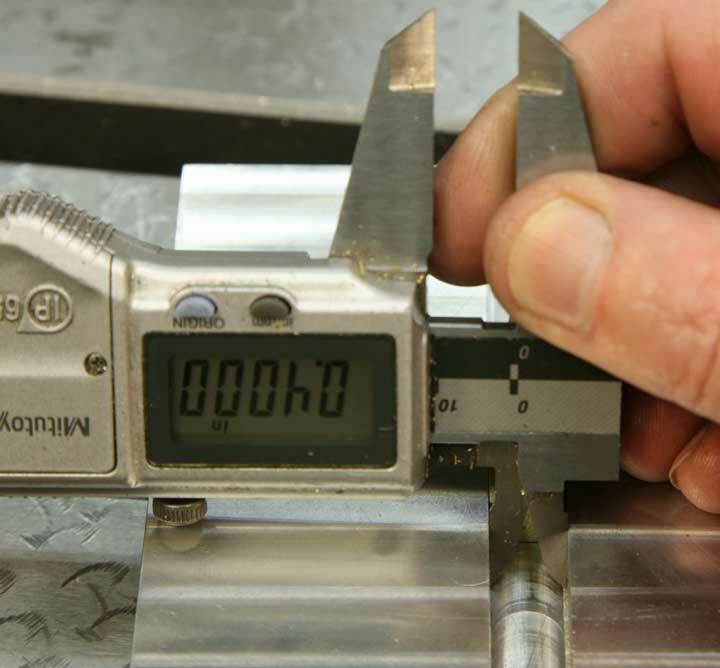 To widen the grooves to the final dimension of .400", you need to take a bit off each edge of the groove. 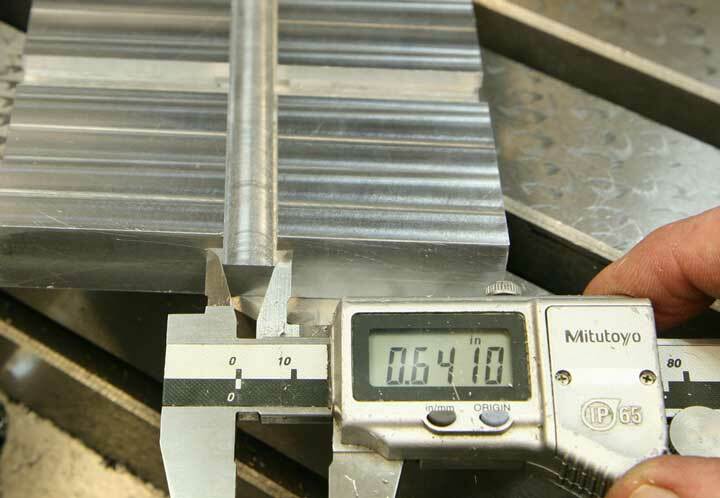 This calculation results in a measurement that isn't easy to adjust using the DRO, so you can choose to take .012 off one edge and .013 off the other in order to get the exact dimension of .400. 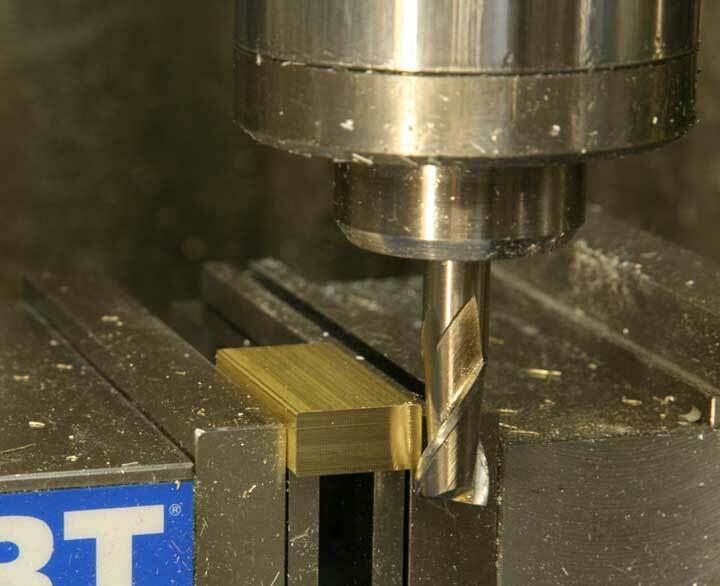 Leave the quill locked and, with the tool off to the right of the work, loosen the Y-axis lock. Move the Y-axis .012. Take a nice clean climb cut across the front edge of the groove. 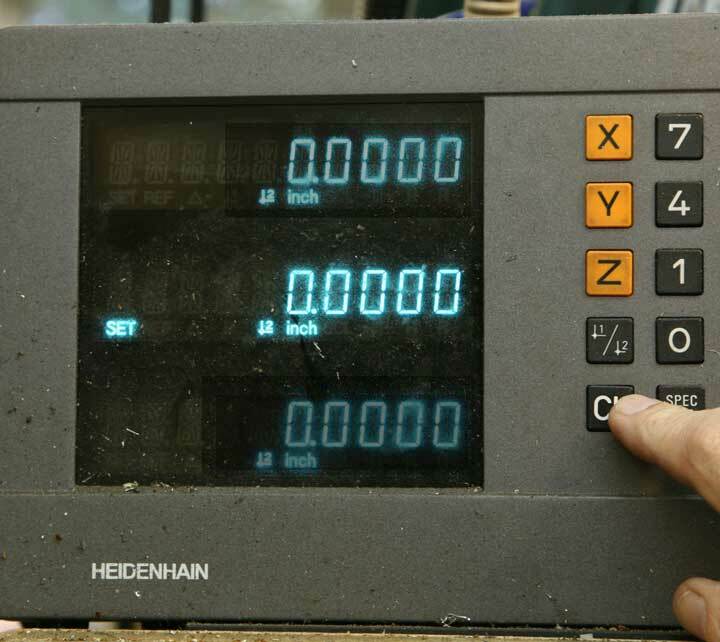 With the tool outboard on the left, move the Y-axis forward .013. And, cut that amount off the back edge. 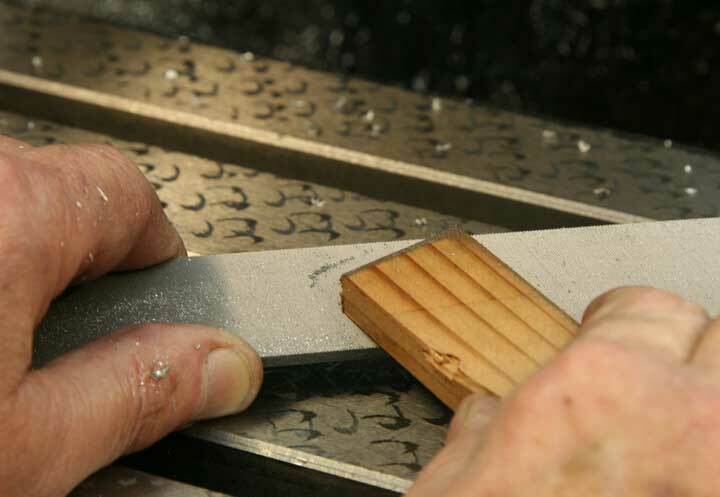 Before you go any further, mark the piece so you can be sure which edge was cut by which amount. This may seem a bit silly, but since the grooves are no longer centered, you could introduce an error when you make the bottom part of the "T-slot." 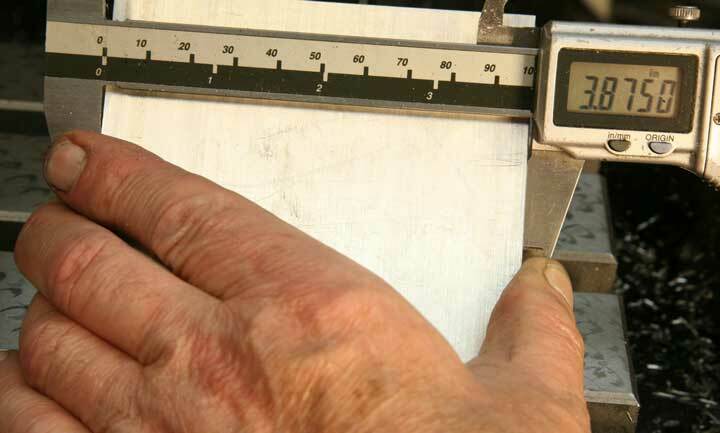 A quick check with the caliper will tell you how close you came to your goal so far. 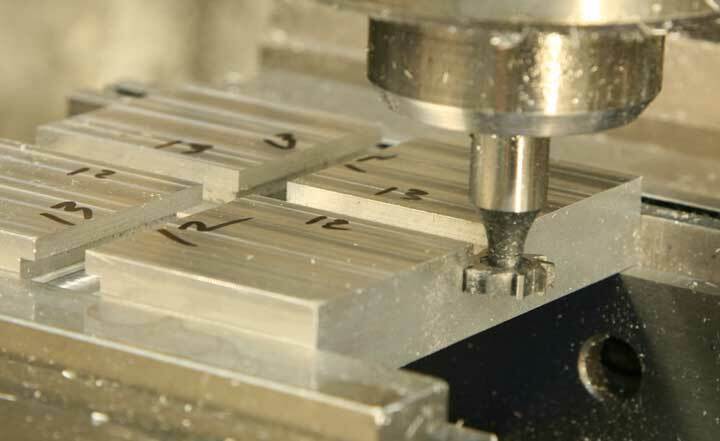 With the T-slot or Woodruff key cutter in the collet, you can set the depth of the cut exactly as you set the depth for the groove. Lower and lock the quill so the cutter is just touching the surface of the plate. Then set the zero on the Z-axis dial, lower the knee a little, move the x-axis to move the tool from above the piece, and raise the knee exactly .300. Return the Y-axis to zero, and lock the Y-axis just as before. 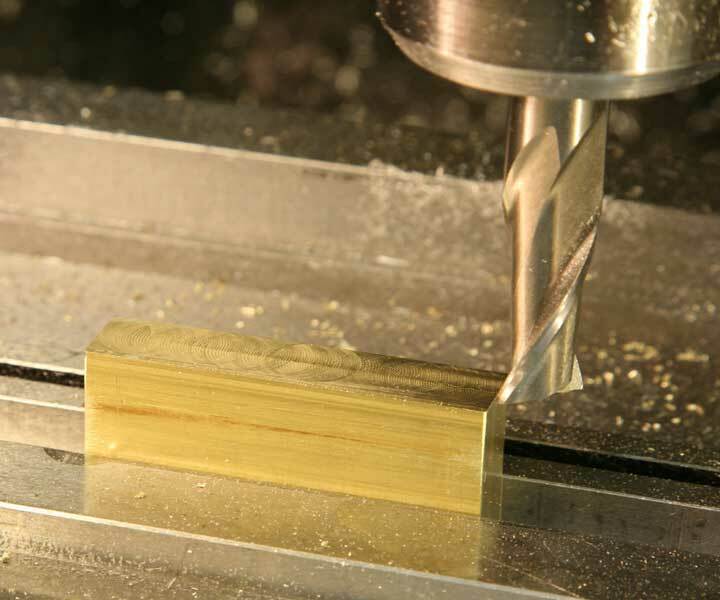 Again, using plenty of lubricant, make the T-slot cut through the length of each groove. The lube is likely to wash off all or part of your marks on the top, so be ready to renew them as you work! Now, just to make the T-slot even with the original groove, and to clean up the tool marks, you'll want to climb cut each edge of the T-slot. Move the table away from you by .002. Take a climb cut off that front edge - the one you cut by .012 when you made the groove. And, repeat for the back edge, this time moving the table forward by .003 so you can make the cut at the back edge where you had removed .013" from the original groove. Well, that's it. Now you have a nice base for your two-slider, and it has clean, even T-slots at right angles. 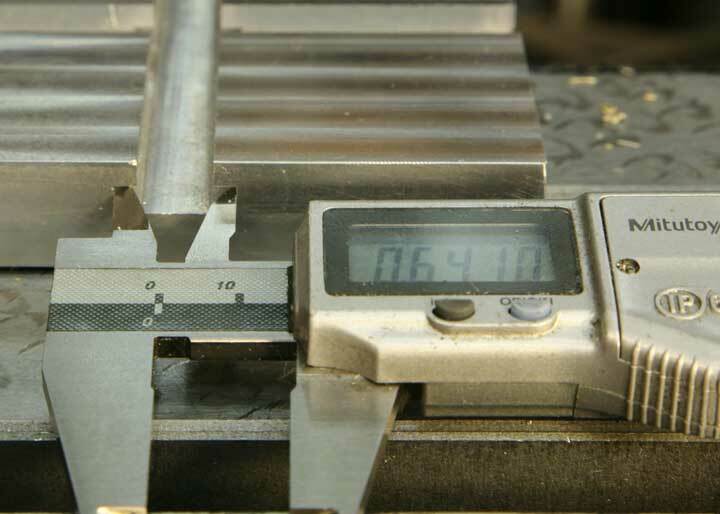 In order to fit the sliders, you'll want to make accurate measurements of the slots in all dimensions. It's no real problem if the measurements are not quite what you were aiming for as long as you use the actual dimensions for reference when you're making the sliders. 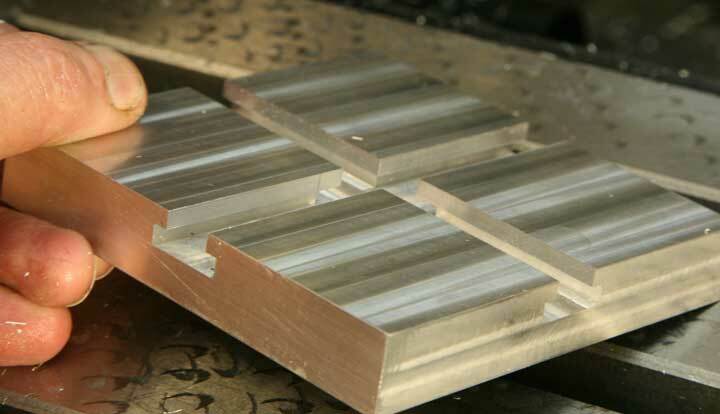 The sliders are brass, for easy machining, and smooth gliding in the aluminum T-slots. 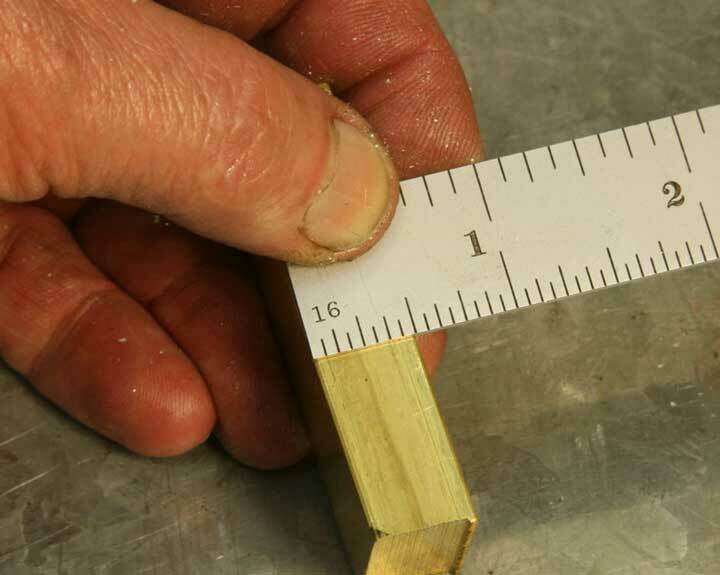 The sliders are to be 1" long, so it pays to start with a piece that's about 2.25". The finished sliders are short, so it's easier to make them as a single long piece to be cut in half after it is fitted to the slots. This particular piece of brass is a bit wide, but that's no problem. It's 1/2" thick, leaving just enough for cleanup and dimensioning to fit. First, trim both ends nice and square, cutting as little off as possible. Grip the brass in the mill vise, supported with parallels. Stand the piece on edge; clamp it down and mill one edge clean and flat. Whenever possible, it's a good idea to clamp small parts in the center of the vise so clamping pressure is more evenly distributed. 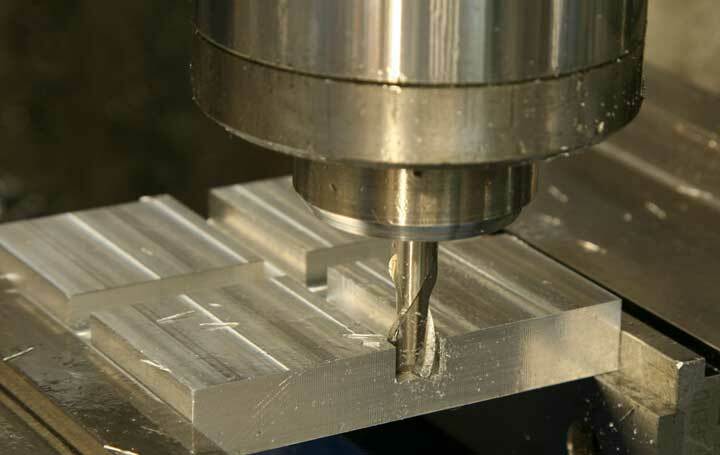 Flip the piece over and mill the other edge parallel and flat. Don't forget to file those corners so the piece will be easy to hold! Lay the brass flat on the parallels and mill both faces flat. OK, more calculation. 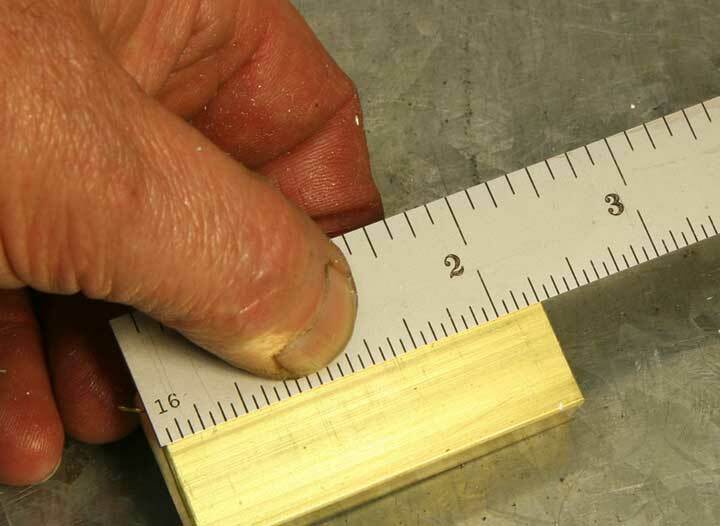 Measure the final width of the brass. And, the width of the T-slot bottom. Here are my measurements. My T-slot has a width of .641 at the bottom, so I want my brass slider to be that same width MINUS .004" or so for easy sliding clearance. So, my slider should have a maximum width of .637 or possibly a tiny bit less. 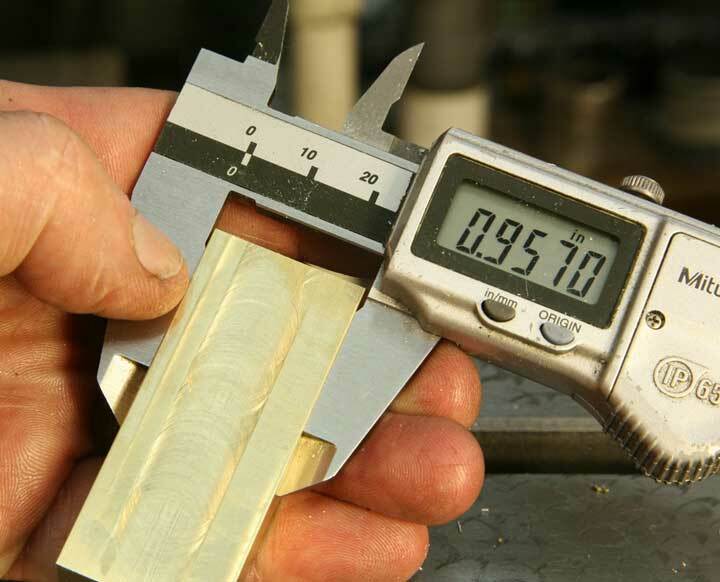 My brass was .957" wide, so subtracting the final width of .637, I know I need to take off exactly .320" to achieve the result I want. 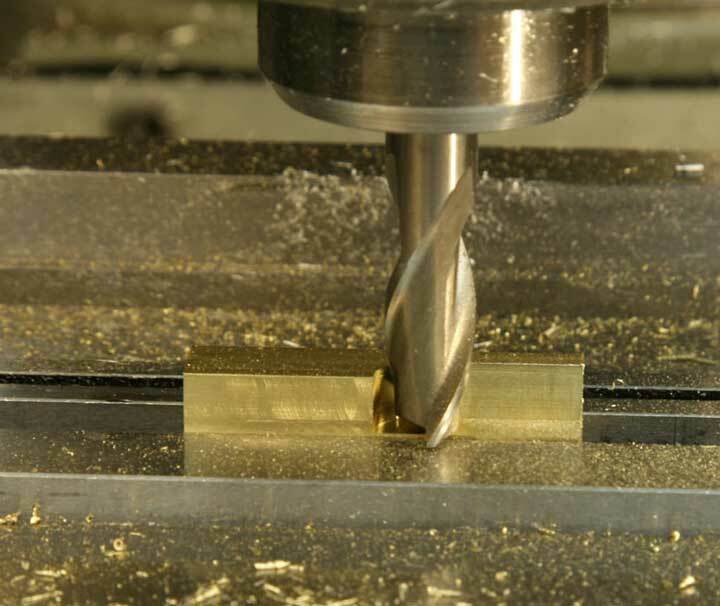 Touch the end mill to the work, lock the quill, set zero on the Z-axis dial, lower the knee just a bit and move the table so the bit is away from the brass piece. 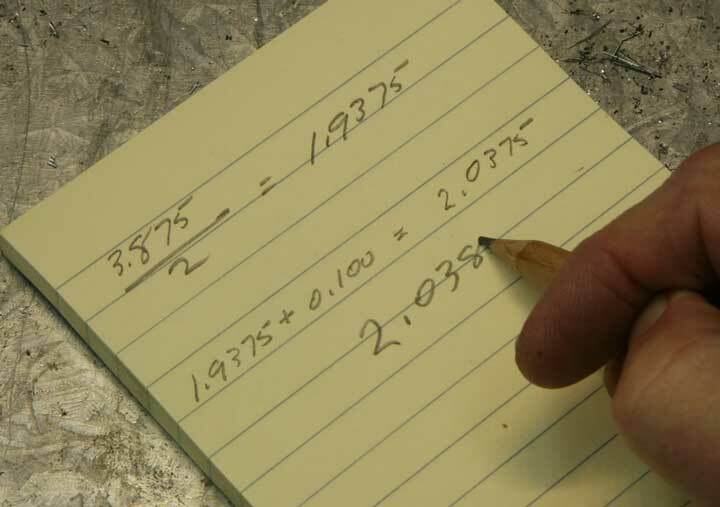 Return the Z-axis to zero and raise the knee by the amount you calculated - in my case that was .320, or three full revolutions plus .020. 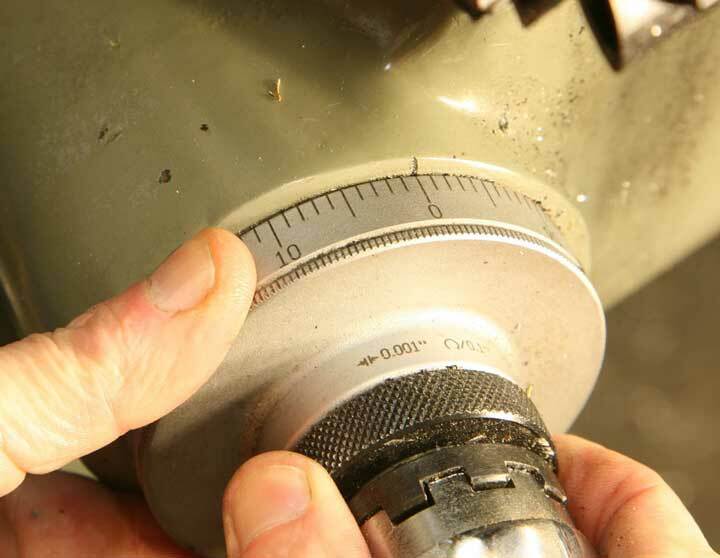 Make that cut across the brass just as you did the aluminum, climb cutting the front and back.